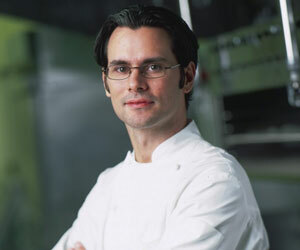 Chef Amoroso's favorite dish to prepare is "butter poached lobster," which is prepared with a seasonal crepe. Michael Mina at the Bellagio began serving the dish a little over year ago; it was summertime, so they used a sweet corn crepe. They liked it so much that when fall came around, they adapted it with a butternut squash crepe and a roasted mushroom crepe. Regardless of its crepe pairing, though, the butter poached lobster remains the same. Chef Amoroso likes that it's simple to prepare and says that lobster, which tends to be a little tough when it's overcooked, is in its perfect form in this dish. "You can't really do it any better," he says, "and cooking in butter allows it to absorb as much as it can and be full flavored. It's simple and it doesnt mean a lot of fuss." The lobster may be Chef Amoroso's favorite dish, but the most challenging to prepare are his signature trios. There are currently five first-course trios and five second-course trios on the menu at Michael Mina Bellagio, all of which present unique challenges. "I think any one of them is quite challenging because you don't just learn one way, you learn three ways. The guys on the line like that kind of challenge," Chef Amoroso says. "The hardest one we're preparing right now is the lamb. It takes more steps than any other one we have. It's very difficult and pretty stunning." Speaking of difficult, we asked Chef Amoroso what he would serve if the most powerful person in the world walked into his restaurant and said, "Serve me anything." The trios, he suggested, would certainly make the cut, in tasting menu form. The main attraction, however, would be the caviar cart, which is served in a tableside demonstration of utter decadence. "I can't say I've been to every restaurant in town, but of the ones I've been to, this is unique to us. Michael prepares a parfait and it's just a brilliant way to eat caviar," he says. "Then there are the traditional choices with the egg, egg white and so on. You can have it one way or the other, or both; it doesn't really matter. I'd serve it with chilled vodka, cold flutes and the champagne."